Although my kids absolutely loved staying in and watching YouTube and playing video games during their summer vacation, there were days where playing outside and leaving the internet for the entire day was a must in my house. Technology has come so far and although there's so much you can do with it, I love seeing my kids outdoors getting some physical play time going on. So, when you can have both, technology and your kids play outside being active, it's a win, win. That's exactly what VTech's new Kidizoom Action Cam does. It allows our kids the opportunity to go outside, get adventurous and record their journey as they have fun. Whether you're on a bike, skateboard, scooter or even in a pool, the Kidizoom Action Cam can record it all. The camera is easy to set up. 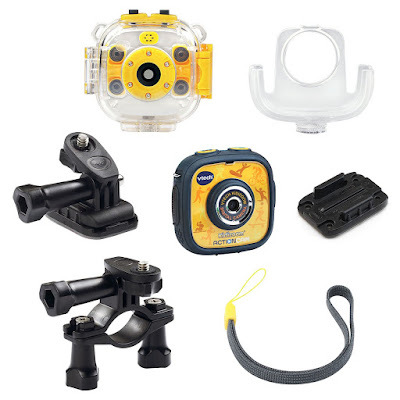 It comes with a flat mount, bike mount, mounting shell, water proof case, wrist strap and a usb cable to put your recordings on your computer and create a pretty neat video to share with your family and friends. Not only is this an action cam, but it also comes with games your kids can play while they're out. Both mounts are pretty easy to attach to both skateboard and bike and in little to no time your kid can begin on their outdoor adventure and record their journey as they go. This is pretty neat. It comes in two colors, purple and yellow. I decided on the yellow as it's a neutral color so that both my son and daughter can use it. Both my kids have been having a blast with this action cam. They've been recording their bike rides to the park and riding their skateboards. Although summer is about to be over, the adventure for your kids can still continue with this camera. The camera is easy to handle, light and is easy to bring with your kids on the go, so if they wanted to record their adventure at the park or when going swimming, they can. The Kidizoom Action Cam is retailed at $69.99 and would a great gift for any kid this upcoming holiday season. With the weather proof case, think of all the adventures your child can record throughout the year. Disclosure: All opinions are my own. 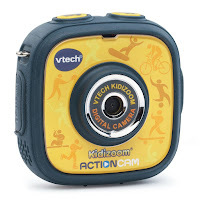 I received a VTech Kidizoom Action Cam at no cost for the purpose of this review. No other compensation was received.